What's strange about The Producers, “the new Mel Brooks musical,” is how relentlessly old-fashioned it is. The musical is much better than the overrated 1968 movie, but a few added four-letter words aren’t enough to modernize a world-view at least three decades out of touch. 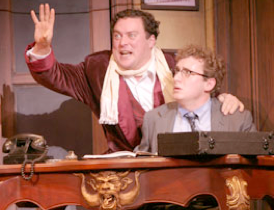 The Producers is really just a "Let's put on a show" musical with the difference that failing producer Max Bialystock (Seán Cullen) and mousy accountant Leo Bloom (Michael Therriault) plan that the intentionally rotten Springtime for Hitler will be a flop so they can pocket the backers' money. In Brooks' world women are either curvaceous airheads or bent-over hags, man-hungry in either case, and gay men literally prance about in lavender and pink. These portrayals, regressive even in 1968, make the show seem not so much offensive as hopelessly dated. Brooks even uses the old "Walk this way" joke. While Brooks' rhyming lyrics are clever, his music sounds like a grab bag of tunes from failed '60s musicals. Tellingly, the music for the supposedly lousy Hitler musical is no different from the music for the rest of show. What helps make up for this utter lack of novelty is Susan Stroman's highly imaginative direction. The fantasy scene in Bloom accounting office, Bialystock's little old ladies tap-dancing with their walkers and especially the entire Hitler musical are visually witty and truly hilarious. Unfortunately, Stroman wants every song to be a showstopper and her directorial overkill exhausts more than enlivens. After the Hitler musical, the momentum peters out and Brooks overrides the movie's ending for one that's sappily conventional. Cullen and Therriault are both too soft-edged for what is supposed to be a satire. The strongest performance comes from Juan Chioran (gay director Roger De Bris) who has the kind of command and assurance that dominates the stage whenever he appears. Note: A version of this review appeared in Eye Weekly 2003-12-11. Photo: Seán Cullen and Michael Therriault. ©2003 Cylla von Tiedemann.